In my humble opinion we don’t have an abundance of very good Chinese restaurants in the Central Florida/Orlando area. When I have PF Changs as one of my top 5 Chinese places on my list that says something. Honestly I do like PF Changs and really respect their Asian food and usually the service is consistent. But where are the very good local Chinese places? 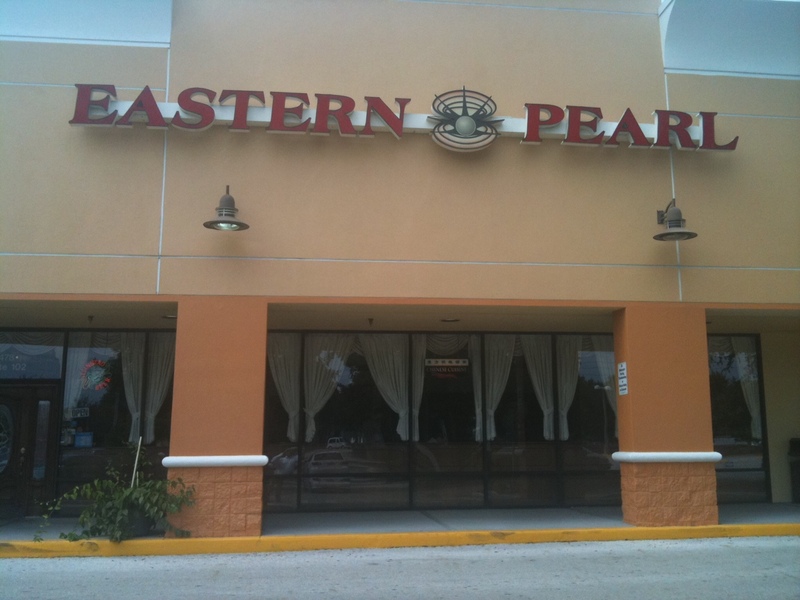 One which I like is Eastern Pearl located in Altamonte Springs. Eastern Pearl is a place to find good Chinese food. This restaurant is located across the street from the Altamonte Mall. EP has been around for many years. This tells me they are doing something right. The interior is elegant in design and most of the furniture was imported from China. The Lazy Susan tables make the food enjoyable and easy to share. The culture of the restaurant makes you really feel like you are in China especially with the Waterfall back drops and waterfall sounds. Nice Chinese ambience and setting to eat your Chinese meal. The menu has your typical Chinese favorites. 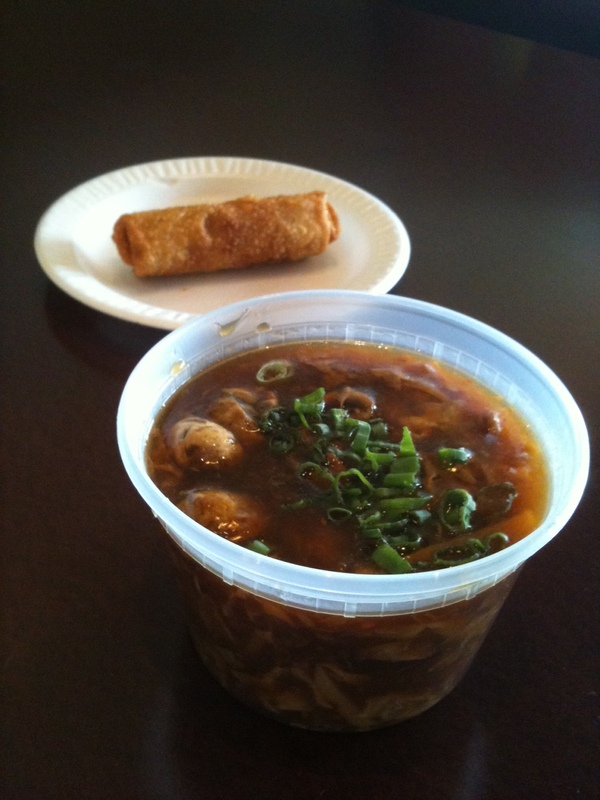 I started with Hot & Sour Soup $3.75. The soup was good and it had the right amount of heat and spice on this day. The Hot & Sour soup was a good starter. I also tried the shrimp roll (2) $3.25. Just your basic egg rolls. Nothing fancy but decent. 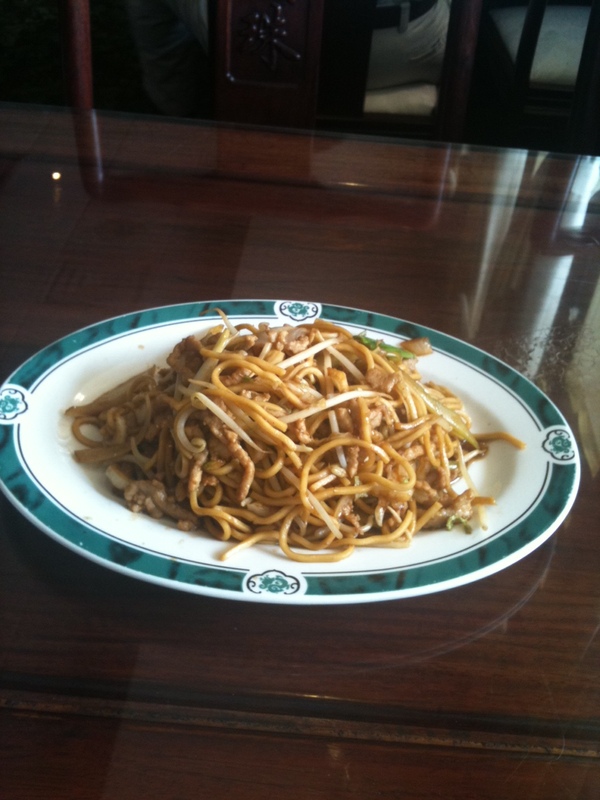 On this visit I tried the Pork Lo Mein (lunch special) with white rice on the side. The Pork Lo Mein consisted of julienne pork strips, fresh sliced vegetables, all stir fried in a good seasoned soy based sauce. Just a good dish of lo mein! They also give you plenty, enough to share. The next visit I tried the Chicken with Black Bean Sauce. This dish did not disappoint. The spiced julienne chicken was very tender, with many fresh vegetables like onions, peppers, mushrooms, and salted black beans which make the dish. This dish was well-balanced and had the right Chinese seasonings fully involved. Good dish! IN ADDITION: On all occasions I found the wait staff to be polite and super efficient. Plenty of parking is available. Easy place to get in and out of for lunch or it’s a place you can take your time and not feel rushed. If you have any other good suggestions on great Chinese food in our area please drop me a line. BTW looking forward to trying Hawkers Asian Street Fare soon! Well the local guy was out chowing down again in the Metro Orlando area. My travels this time takes me to the Maitland/Altamonte Springs area. I was in the mood for some Chinese food for lunch, so I headed out to Yum Yum Asia Café. The meal I had at Yum Yum was very good for a sit down/take out restaurant. It’s not a big place but there is ample seating inside or you can choose to eat outside. I chose to eat inside. You place your order at the counter, they give you a number, and they bring it to your table. Yum Yum has a lunch special that includes an egg roll, vegetable spring roll or soup & choice of vegetable fried rice or steamed rice. Most dishes are $6.45 or $7.45 for lunch. I started my lunch experience with hot & sour soup. I must say I have eaten Chinese all over the place including China town in San Francisco, New York, Chicago, LA, Honolulu and I have never had better Hot & Sour soup then at Yum Yum Asia Cafe. It s to die for folks. Yum Yum’s Hot & sour soup does not get better than this. It was rich in flavor. The vegetables in the soup were cooked just right, they use fresh mushrooms as well, and the meat was tender enough and the soup was topped off with scallions. It was semi dark in color but not too dark (that’s important to me). I don’t like my hot & sour light in color and made broth like. The hot & sour soup had the right spiciness to it and boy it was kicked up a couple of notches, but in a good way! 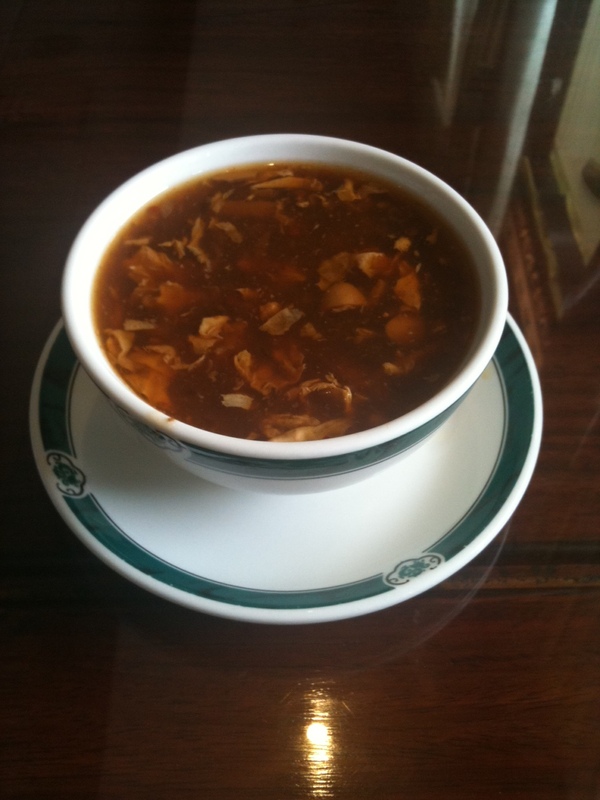 It is by far the best hot & sour soup on the planet in my opinion. Next, my entrée was brought out. I ordered the Chicken with Black Bean Sauce $6.45 with white rice. There was a pepper figure on the menu next to the item indicating this dish is spicy. The dish was very good in flavor but it was not spicy, I would eliminate the pepper figure on this dish on the menu. The chicken was tender, the vegetables were fresh and it was cooked in a nice flavorful dark sauce. There were enough black beans in the dish to balance out the flavors of the chicken and cooked vegetables (fresh onions, green peppers, carrots, mushrooms accompanied this dish). The dish was served piping hot! I like it just out of the wok, I like watching the steam coming towards my face. My second visit I had the hot & sour soup again with just an egg roll. Did I share with you they have great Hot & Sour soup?? I also had the vegetable egg roll. The egg roll was just Ok. Nothing exciting but not bad. When I have an egg roll that’s just ok, I usually make a nice sauce on the side; I mix spicy mustard, duck sauce, and soy sauce together and dip my egg roll into this rich dark sauce. I can’t think of a better dipping sauce for an egg roll my friends. I know the sauce is not very ingenious but it works for me. Yum Yum is located in a strip mall with Publix being the anchor store. 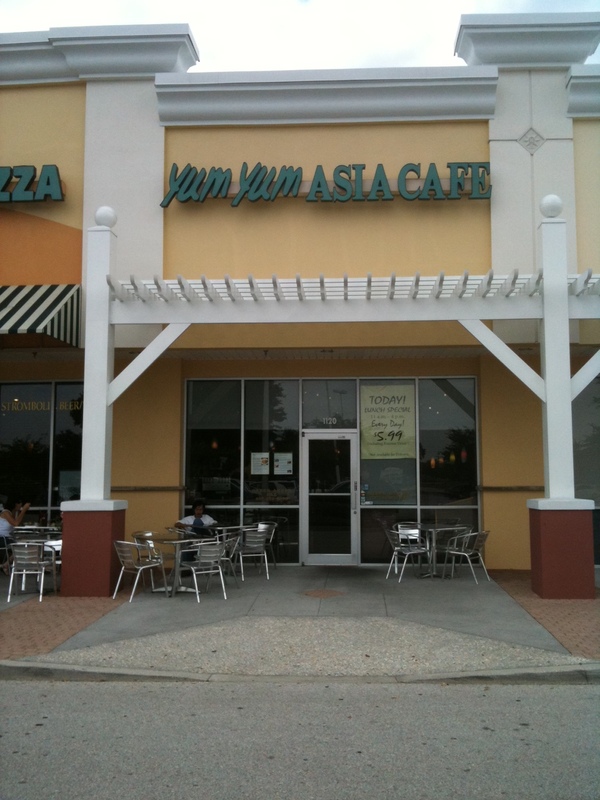 Yum Yum Asia Café is nearby the Maitland exchange and Forest City Road (434) area. Yum Yum is open 7 days a week. Mon-Thur 11am -9:30 pm, Fri-Sat 11am-10pm, and Sun 12-9pm. They do deliver and cater and you can order online at http://www.yumyumasiacafe.net.